Discussion in '1940' started by nosmig, Aug 10, 2010. I've a long letter written by my Uncle Jack (John A Coleby) after his evacuation via Operation Cycle in June 1940 - and I'm trying to fill in some blanks. He was a signaller attached to 75th Field Regiment RA, part of SAAR Force and 51st Highland Division. Later he joined REME. I doubt if there are any Cyclone veterans on the forum, but it is amazing how many threads get reopened by new members saying "my dad/uncle was at... and remembers/told me stories of..."
Drew has done a lot of research on the BEF, if CL1 hasnt already given him a prod I'll send him a P.M. now and see if he has any info. What blanks are you trying to fill in? Thanks CL1. Letter isn't too personal - but it's 3½ pages of A4 - so a lot to read. To me it's a fascinating account of a few months with BEF in N France in 1940. Hello Slaphead (That's what my son used to call me!) - thanks for the encouragement and help. I'm tring to get hold of a copy of Jack's Army records but that's a bit of a rigmarole - and time-consuming. Firstly I think the letter sounds facinating, I'd love to read it if you can scan it and I'm sure the RA chaps and the other 1940 nuts on here would love to read it too. You never know what we may find written within it. How are you struggling applying for his records? We maybe able to help. I found the process quite straight forward although there is a bit of a waiting list. Do you live anywhere near the National Archives at Kew? 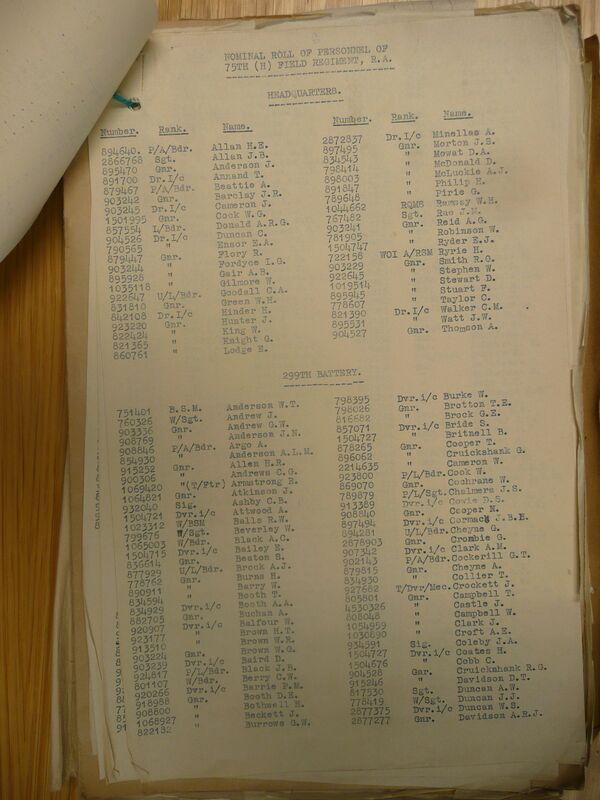 The Regiments war diary is held there and the ref number is WO167/495. On a side note I would add Royal Artillery to the title to attract the RA boffins. Thanks for your reply - and the encouragement. Getting the records, as you probably know involves money (not a major problem), form-filling and a death cert which I don't have at present. Sadly Jack died when swimming off Yorkshire coast in 1963 and his body was never recovered, so not straightforward. Once letter is checked for errors, I'll have a go at posting it. Currently it's a 6 page PDF doc (inc a rough map and some images - so I'll have to find out how to upload it. And being in Cornwall isn't v handy for Kew! More in due course - as soon as the editing is done. I'm new to this site, so apologies if I adding this thread in the wrong place. Elsewhere, there is a separate posting about seeking any further information about JA Coleby - my Uncle Jack - who was evacuated via Operation Cycle in June 1940. And if I've managed the attachments correctly there should be a PDF file which includes a transcription of a letter Jack wrote after his evacuation, and a few other bits and pieces. I tried to create a map showing his movements in the time he was with BEF, but a lot of this is guesswork - based on the information in his letter. I found it fascinating to read; I hope it is of interest to others. The letter from my Uncle Jack is now posted! It forms part of a biggish PDF file where I have added an attempt at a map showing his movements prior to evacuation (sounds like a medical examination!!). I discovered that this file could be added only as a New Thread - which I've posted to the 1940 forum - with 'Coleby' in the title. Great Stuff ! You are most fortunate to have more information in that detailed letter than most find after years of research. welcome to the forum Nosmig. Good Luck. I'll echo that! an incredible document. So many of the survivors never wrote down their experiences. Welcome Nosmig, the 'experienced hands' offering help straight away as I found, good luck. Fascinating letter and thanks for sharing it. There is much more detail of the movements of the batteries etc within the actual diary itself but would take to long for me to write them all out. May and June locations may contain spelling mistakes as the diary is hand written for the last two months. He was in 299 Battery according to the Nominal Roll below from the January section of the diary. This is my first post and would like to ask if there is any more information available anywhere regarding the movements of the 299th Battery. I have recognised a family member on this document, who went missing on 5th June 1940 after only a few weeks in France, and was declared missing in action two years later. A later newspaper report said he went missing after action at Quesnoy in Northern France. We know he is now buried in Franleu Churchyard. We always remember him and respect his memory, especially at this time. Hi Seddy - and welcome to the forum. I think the best person to answer your question is our 1940 man who is in fact member Drew5233, so hold tight and he should be along some time soon [if hes not basking in the Bahamas again!!]. I am sure he will have the War Diaries for them. Perhaps you could in the meantime post the persons name ?? Hello and thanks for replying. The name is L/Bdr Andrew James Brock. I've done a lot of research on him over the years, more so recently. He was my wife's great-uncle and is commemorated on the momument just down the road from our house. He went to France within days/weeks of his marriage in May 1940 and was killed on 5 June. So sad. A newspaper report I saw said he was one of two motorcycle riders, the other being Captain Miller, who went out never to return at a place mentioned named Quesnoy, although he is buried some distance away at Franleu Churchyard. I have just seen a biography of Captain Miller on another site which suggests that some of the unit got split up and that he (Captain Miller) volunteered to go out and look for them... this has left me wondering if Andrew also volunteered. Another question I have is what does the 'U' stand for in 'U/L/Bdr'?